These homemade Turkey Sausage Patties are extremely flavorful and savory. You could serve them for breakfast with eggs or even for lunch and dinner. They can also be made ahead for breakfast for the week. Making your own turkey sausage patties from scratch is easy – and bonus, no processed ingredients! 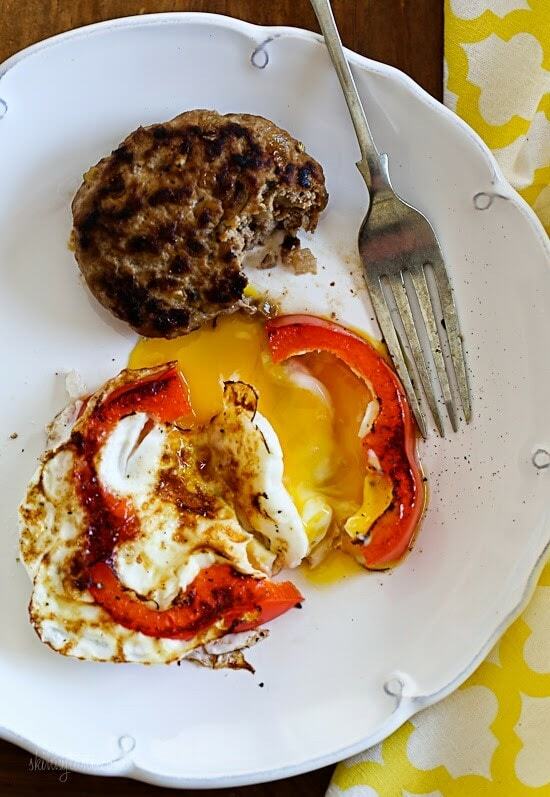 I made these for breakfast with my Red Pepper Egg-In-A-Hole and it was delish! Guest post from Jackie of CAFE, Celiac and Allergy Friendly Epicurian. I am excited to be here on Skinnytaste again. After working at Bon Appétit for 8 months I am happy to be back home with the kids and focus on developing recipes on a freelance professional basis as well as for my website. In addition to gaining a ton of experience while working in the test kitchen, I gained a few pounds. Occupational hazard, I suppose. I decided to re-join weight watchers and work on creating and maintaining healthy eating habits once again. I used Weight Watchers after the last 2 of my 3 sons were born and it is my favorite weight loss program. The balanced approach is not only physically healthy but I’ve found it to be the best for my long-term success. Once I started calculating points for all of my recipes, I immediately thought of Gina and of course all of you here at Skinnytaste. 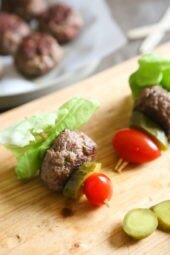 These Turkey Sausage Patties are extremely flavorful and savory. You could serve them for breakfast with eggs or even for lunch and dinner. I soften the onion and garlic and then toast some fennel with the mix to add a depth of flavor you wouldn’t get by just adding everything raw It’s a short extra step that is definitely worth taking. Once cooked, refrigerate for 4 to 5 days. To freeze cooked, wrap tight in plastic and freeze for up to 3 months. To reheat transfer to the refrigerator then reheat in the microwave or air fryer. 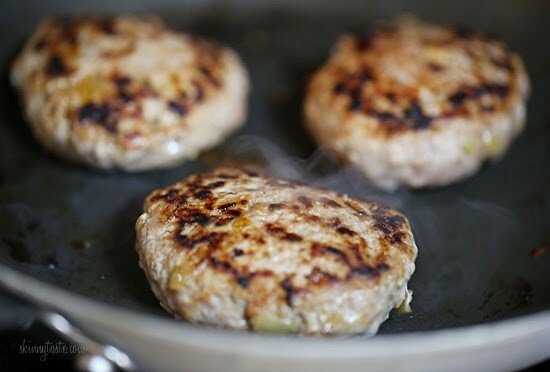 Making your own turkey sausage patties from scratch is easy – and bonus, no processed ingredients! 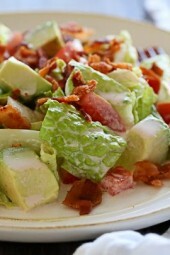 I’m so honored to have my friend Jackie share this recipe here on Skinnytaste as a guest post. Jackie is an incredible chef with Celiac, and has a blog called CAFE, Celiac and Allergy Friendly Epicurian where she shares her gluten-free recipes. I made these for breakfast today with my Red Pepper Egg-In-A-Hole and it was delish! Heat a medium nonstick skillet over medium low heat and add the oil, onions and garlic and stir frequently, about 4-5 minutes, until onion is translucent. Lower heat, if needed, to avoid browning too quickly. Once onion is softened, add fennel and toss quickly until fragrant and toasted, about 1 minute. Remove mixture to a medium bowl to cool slightly. Add ground turkey, red wine vinegar, chives, paprika, sugar and nutmeg to bowl with onions, garlic and fennel and mix together with a fork until all ingredients are well-distributed. Form mixture into 6 even patties and lay on parchment or wax paper while working. If you want to make these for another day, they can be refrigerated or frozen. Spray a non-stick skillet and set over medium-low heat. Once hot, brown turkey patties, in two batches, 3 minutes on each side. Once you have achieved a nice browned crust on each side, reduce heat to low and cover. Continue cooking until internal temperature reaches 165. Remove from heat and repeat with second batch. What I am doing wrong if my patties keep falling apart when I try to turn them? They don’t seem to bind well for me. The same thing happened to my Salisbury steak. Delicious! Doesn’t have a typical flavor of breakfast sausage and could easily be used for a turkey burger. I often make these with a fried egg on top and sprinkle a little feta cheese. I cooked 3 min a side and finished in the oven (5 min on 250). Terrific, so much better then anything that you can buy. Will try to keep them in freezer ready to go. I made them small and got 14 of them and it is a nice size for just a touch of sausage added to a breakfast sandwich. or what ever dish making. Seasonings were wonderful plus added a bit of Penzey sausage seasoning too. So much better being able to cut the salt to a reasonable level. I cook for my mom too that needs to have a low sodium diet and it helps to make your own foods. Thank You! I just made these! They are really really good. I added a bit more of the spices and that really bumped up the flavor a bit. Love! I made these this morning and they were really good but next time I would up the seasoning a bit. This was not flavorful enough for me and I didn't think the vinegar works either. 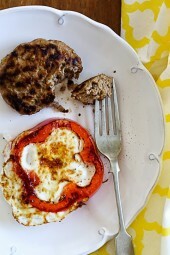 Wholefoods has a great turkey breakfast sausage recipe. What's the best way of freezing something like this? I'm the only one who would eat sausage, but that's a lot of sausage for one person! https://potsknivesandrecipes.wordpress.com/ which has great information. Yummy!! We love to have turkey sausage for breakfast. I'd love to have a healthy version. Can't wait to try them!! Yum! Looks amazing. Always looking for something different to do with ground turkey! I found a recipe for turkey sausage last year which was wonderful but I lost it. Tried searching on line but nothing sounded close. This one does so I am really happy to have a recipe for turkey sausage again. I have been able to get my "red meat" hubby to enjoy turkey chili and the turkey sausage I made last year, so I know he will like this recipe. ? Well, these look delicious! Perfect breakfast idea! No recipe is written in stone. Salt is usually "to taste." I buy low sodium or unsalted everything. Then I can salt to my taste. Don't be afraid to modify to whatever you like. Gina knows what she likes and she knows what she's doing. Thanks, and yes modify however you wish! Add cheese, roasted pepper, etc make it your own. Oh, great recipe! I don't buy a lot of turkey sausage because of all the extra junk some have in them. This is the perfect solution. I am pinning this! Thanks to Jackie for sharing. I don't buy sausage for the same reason. I am looking forward to making these! If I have ground deer meet, could that be used in the place of the turkey? This sounds amazing! I've never made my own sausage patties before. Does the recipe call for fresh or dried chives? Can't wait to try this recipe – so healthy! I am so anxious to try this recipe as it does not contain sage. Sage is one spice I do not like. This recipe looks and sounds great! Thanks so much! You can honestly modify this with any herbs. Haha…I was going to omit the nutmeg and add sage because I hate nutmeg! I so don’t like nutmeg, tarragon or sage… what can I use? These sound great, can't wait to try it out! Looks amazing and so simple! just made these and love them! love the reduced points by not using bread crumbs or eggs. the only thing i would modify for next time is adding some salt/pepper. i do feel that was definitely missing in these. there is salt & pepper in the list of ingredients. Yes, it's in the ingredients. Jackie used 1 tsp kosher salt in hers. also wanted to add that these go great with Harissa Eggs in Purgatory which I've made at least a half a dozen times. and Gina thank you, I've gone from a size 12 to a size 6 in 3 months from cooking your recipes. Always love having sausages for breakfast with my eggs and pancakes. Never thought about making them myself. I usually just buy them pre-made but this is a great idea for those nice weekend mornings. Thanks for sharing. 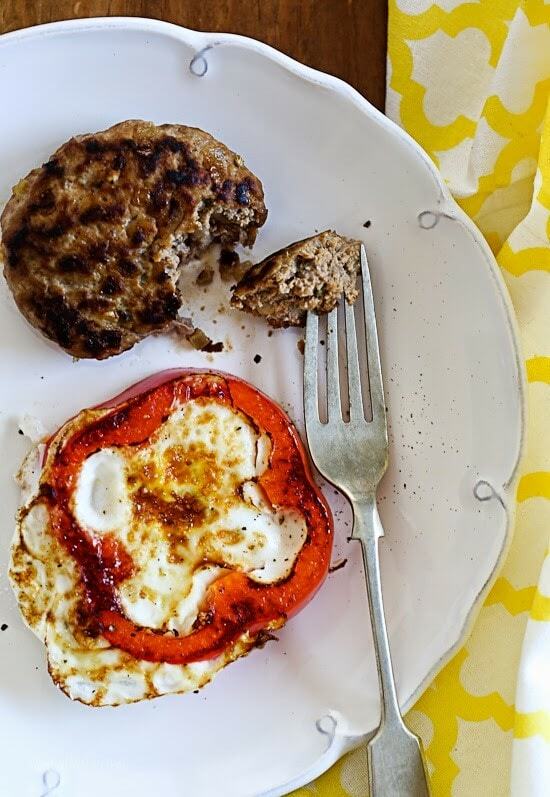 To buy breakfast-spiced turkey sausage in the grocery store is so expensive but I would definitely buy some ground turkey in bulk and use this recipe. The patties would freeze great! These look great! I'm off tomorrow for Presidents Day (hubby unfortunately isn't) and I have all the ingredients on hand so I think I'll get up early and surprise him with breakfast. I'll be excited to try this like a bulk sausage and use in an egg casserole too. Thank you so much! 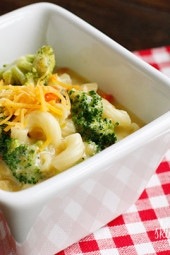 Great idea on the bulk in casseroles ! !